The Bloomsburg Area YMCA is a cause-driven Columbia County organization that is dedicated to Youth Development, Healthy Living, and Social Responsibility. The Bloomsburg Area YMCA addresses these needs through our facilities, programs, and community collaborations with like-minded organizations. Hundreds of local kids are cultivating the values, skills, and relationships that lead to positive behaviors, better health and educational achievement. We currently serve over 1,000 members, with about 1 out of every 5 members being children and teens. 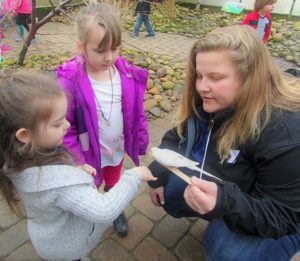 Our Preschoolers enjoy fun and educational field trips! Our preschool uses the Creative Curriculum program, which contains units and materials that encourage students to explore and discover new ideas. In addition to this curriculum, our teachers lead units related to months, holidays, and special occasions following state standards. Our students enjoy a number of exciting visits into our community emphasizing discovery and engagement with both role models and peers. The Y offers before and after-school care, which impacted over 70 kids in the 2017-18 school year. Research shows that children who participate in after-school programs are more successful in academics, are healthier, and have greater self-confidence. The goal of the Bloomsburg Area YMCA’s Child Watch program is to provide quality care to children 6 weeks through 12 years whose parents are utilizing the YMCA facility. Child Watch is offered at no cost to members. 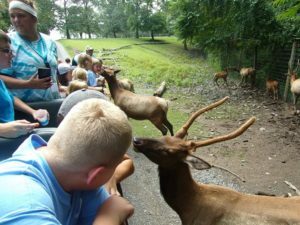 Summer Campers explore PA on exciting field trips. YMCA Summer Day Camp and our new Kiddie Camp provide a happy and healthy environment for children to learn and grow. Children have the opportunity to build self-confidence, independence, and creativity. Parents have peace of mind knowing their children are in a safe and enriching environment. This summer, children will learn, grow, and thrive through the exhilarating fun of camp at the YMCA while exploring nature, finding new talents, trying new activities, gaining independence, and building lasting friendships. Our world is 71% water. Your kids are 100% curious. Swimming lessons at the Bloomsburg Area YMCA are designed to teach kids water safety. When kids know how to be safe and responsible in, on, and around water, they are more prepared for a lifetime of fun and discovery. Two children under fourteen die from drowning every day. While swimming lessons cannot prevent every drowning, kids equipped with the ability to swim are more prepared in times of crisis. That’s why early swimming lessons like those at the Y are so critical for our community. To combat pediatric obesity, the Bloomsburg Area YMCA now offers our annual Healthy Fit Club at NO CHARGE to kids in 1st – 5th Grades. We didn’t do it alone. Our Healthy Fit Club is sponsored by Geisinger Health Plan, the United Way of Columbia & Montour County, and the Bloomsburg Area Community Foundation. Healthy Fit Club had more than 30 participants over 11 weeks. The Bloomsburg Area YMCA has long been recognized as a provider of resources and encouragement toward pursuing a healthy lifestyle in the Bloomsburg community. We have honored this commitment through engaging group fitness classes, exceptional fitness equipment in our upstairs and downstairs facilities, and personal training/nutrition counseling models designed to help every member achieve his or her personal goals. The Bloomsburg Area YMCA has an abundance of resources for adults in our community looking to reduce the risk for chronic illness by losing weight. In addition to our fitness facilities, a large number of group classes, and personal training options available, we hold regular Get Healthy, Get Lean, Earn Green weight loss competitions that encourage participants to work toward fitness in a friendly competition. Participants in our first contest lost a total of 226.7 lbs, and many have returned for follow-up competitions to continue their weight loss journey. Seniors at the YMCA experience a strong sense of belonging and a network of friends who provide supportive communities for sustained health and well-being. The Bloomsburg YMCA currently serves 421 active older adults. We provide programs including fitness classes, recreation, and special events specifically to meet the needs of people over the age of 62. The Y is fulfilling its commitment to healthy living in the Bloomsburg community by adding evidence-based health interventions to our schedule as a supplement to traditional models of health care. As we expand our work through these innovative programs, the Y is once again reminded of our role as a resource and refuge to those in our community seeking health, hope, and happiness. Through implementing LIVESTRONG at the YMCA, the YMCA Diabetes Prevention Program, and Blood Pressure Self-Monitoring, we are doing more than ever to ensure those facing chronic disease have a community of care behind them. In our tight-knit community, it’s hard to find someone whose life hasn’t been touched by cancer. Whether it’s a sibling, a parent, a child, a colleague, or a friend, we have all known someone who has faced this devastating disease. Survivors in our community have made it through the toughest challenge of their lives, but the process of recovery can still be long and fatiguing. 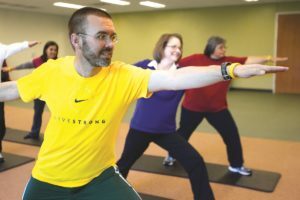 LIVESTRONG at the YMCA is a twelve-week program of group fitness classes and strength training exercises provided at no cost to participants. These sessions have been affirmed through years of evidence to reduce fatigue and improve quality of life during the fight against cancer. All staff offering the program are trained in cancer treatments and recovery. Through LIVESTRONG at the YMCA, the Bloomsburg Area YMCA will embrace a new role in the community as a refuge for cancer survivors. 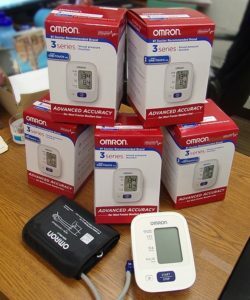 Participants in our Blood Pressure Self-Monitoring Program will receive a blood pressure monitor to help them track their progress! According to the American Heart Association, 1 out of every 3 American adults (nearly 80 million people) has high blood pressure, a key risk factor for two of the leading causes of death in the United States: heart disease and stroke. This risk can be modified through long-term lifestyle modifications, but these changes can be challenging for someone trying to tackle them on their own. The Blood Pressure Self-Monitoring Program helps adults diagnosed with high blood pressure learn proper measuring techniques and obtain individualized support and nutrition education to manage their blood pressure more effectively. Goals include reducing blood pressure and developing healthier eating habits. Change is tough—but we can help. To help reduce risk for diabetes, the goal of the YMCA’s Diabetes Prevention Program is to reduce a participant’s body weight by 7% and increase their physical activity by at least 150 minutes per week within the first half of the program. Everyone needs a push, a pat on the back, a helping hand sometimes. As participants in the YMCA’s Diabetes Prevention Program, members will take 25 classes over the course of a year surrounded by a group of supportive people with common goals who care about your well-being. In 2017, we provided over $26,000 in financial assistance to youth, families, and seniors for membership and programming. All individuals who received financial assistance could not afford a membership otherwise. Through engagement with families, the Y helps them learn, grow and thrive, individually and together. Strengthening families nurtures the potential of every child, improves family health and well-being, and provides opportunities for families to contribute and support their communities. 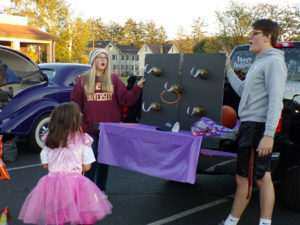 Our Healthy Kids Day and Trunk or Treat events bring families together by having them turn off smart phones to share a family meal and participate in team-building activities, all at NO CHARGE! Our YMCA provides opportunities in the form of programs and services to over 14,000 people in diverse communities within the Columbia County region. We bring together young and old, men and women, people of all faiths, backgrounds, and incomes. Our YMCA recognizes the need for inclusion of special needs populations and strives for ADA compliance in our facility. Through community gifts and grants, we built an ADA compliant ground level Youth and Senior Fitness Center in July 2016 that is designed to be safe and effective in supporting healthy living for teens, seniors, special needs, and elderly participants! The Y lends a hand to like-minded, charitable organizations in our community. Examples of community nonprofit support in our community include offering approximately 200 hours of facility usage to the Girl Scouts, Boy Scouts, Youth Little League, the United Way, and others at NO CHARGE in 2017! The Bloomsburg Area YMCA is “Going Green” by practicing environmentally friendly and ecologically responsible lifestyle as well as making decisions to help protect the environment and sustain natural resources. To reduce our carbon footprint, we are currently taking steps to conserve energy, reduce waste, and recycle. Every two seconds, someone in the United States needs blood, according to the American Red Cross. 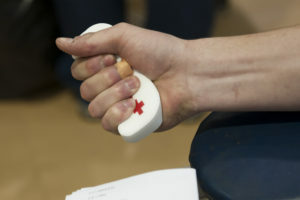 Every eight weeks, the Y hosts a blood drive for the American Red Cross. Each drive receives about 20 donations, saving up to 60 lives. Registration for blood drives is generally available in the Y at least a month prior to the date of the drive. You can help us make a difference. Donate today!